Like you, I'm an introvert and make no apologies..never have, never will other than to say, living in solitude makes me crave more and more solitude. I was considering going to see Lyle Lovett when he comes to Richmond, VA and had, just about, decided to buy a ticket. when I went to the website and saw elbow to elbow with scarcely any sun light much less room between people and I absolutely GASPED! There's NO way I'm going to brave that kind of crowd; church on Sunday morning is all I can handle. Even now I shudder at how close I came to pushing myself over the edge. Sounds like a good book but this is as close as I'll get; thanks for the review. I am an introvert, definitely. Thanks for the book review. I rarely listen to tv or radio and in our 21 years of marriage, we have never been to the movies! Like you, I like rambling around the house, cleaning or baking or playing with our pets. I hear you Deborah...I am the same. 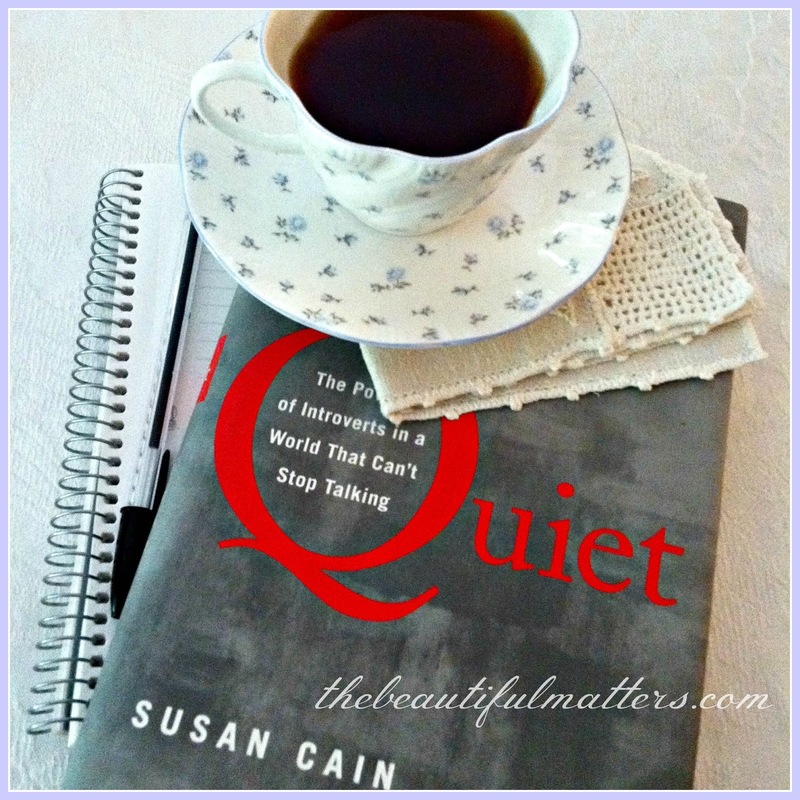 I would much rather be "in the quiet" although I do love family and friend get togethers! I'm wondering how you reconcile Blogdom to the need to be away from the constant prattle? I have read a review or two on this book in other places, but yours is the most comprehensive and makes me think that I'd read it if I found it at the library. Oh Vee, that's easy . . . I just close my laptop! This is me, too. I have my moments of being extroverted but I really do feel that I am on the introverted side of the spectrum. I like to socialize but I can only do it for so long before I am depleted. This book sounds like a good read! A lot of people think introverts are anti-social. Not true. It just means we are energized by quiet time, and need to have some in our lives in order to function at our best. Hello, How are you doing? I loved how well you wrote this review. I am really somewhere in the middle! I cannot stand to have music or the TV on . I have to have large chunks of quiet! I also need a bit of girlfriend time every few weeks! I love to write and read and study the word. I think I have enjoyed blogging because I can chat when I want to!! Wonderful review of what sounds like a very thought-provoking book. I'll be looking for it. I could relate to what you wrote... very much so! Cut from the same cloth (again), I do believe, dear Deborah! Hugs and thanks SO much for putting into words things I think about often. PS I truly hated those team/group projects in school. Those were so straining to my soul. I hope somebody in education-land gets that!! I read this book several years ago and found it both interesting and affirming of my own introversion. The changing cultural norms were a fascinating insight. I thoroughly enjoyed your post, dear Deborah! My husband calls me his "Wallflower" since I tend to be quiet and shy around lots of people. I would much rather stay at home than be in large crowds. Blogging is such a wonderful way of communicating with others, making friends around the world, and just being myself. By the way, your tea cup is simply beautiful. Hugs to you, sweet lady! I made note of this title since it sounds like a perfect read for me, being an introvert. I like to spend time with friends, like today I organized a lunch with 5 friends, but then I like quiet time the rest of the afternoon, gardening and reading and chatting with hubby. Many of us are introverts and I'm not afraid to declare I'm not a people person. I see myself in the descriptions above as well so it's nice to know there are others the same. Blogging has made it easier to make friends and when I'm not in the mood to post or comment, my laptop is shut too, sometimes for a couple of days. 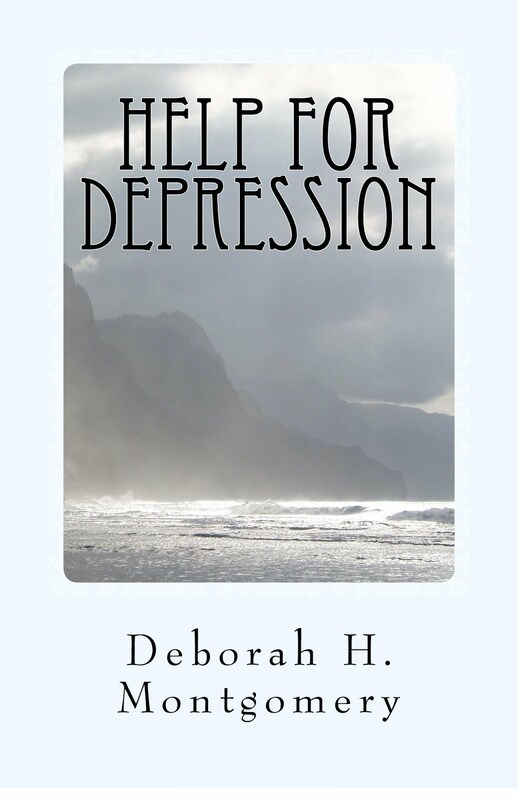 Good book review and discussion Deborah. You are very much like me but in fact we are only a kind of intellectual introverts... We don't agree with all the blabbering about 'nothing'... that annoys us and feels like a wasted time. For that, sure I too would rather curl up with a good book and a tea on hand in my own comfortable space. Some people are only busy with their own EGO all the time. On FB it is also annoying to see the many selfies and me-me postings or borrowed things from others that they love to share. They have in fact very little to say or write about! Sadly we do live in a world of ego-gratifying self promotion to an alarming degree. The ubiquitous 'Selfie' is just one annoying symptom. Thankyou for reviewing this book - it is on my wish list and I have been wanting to read it - I might move it up the pile. I am a people person and love being around people (which is probably why I like going to work) and I can also be a chatter box, however give me a book and I will go off quietly and not say boo to anyone!! I would love that book, it's my kinda read. Yes, I'm not an introvert, but hubby is. Your post is very interesting and I so enjoyed it. I too retire to my room and look for peace and quiet and with a good book or a pretty decorating magazine, even if they're old. I've been sick with a cold, so instead of complaining I decided to enjoy my illness by staying in bed as the weather here is chilly and rainy. I am feeling a little better, but right now I'm retiring to bed again, lol! Thanks for your sweet and kind visit honey, you always make my day! See, we have something in common, we both have the Asiatic Pheasants transferware plates and I also collect the red! Sounds like a wonderful book Deboarh! I am more of an extrovert, but hubby is definitely an introvert. However, I do love alone time and quiet time. When I was painting my sewing room hubby would come in and say, 'do you want some music?" He was so sweet and hook music up for me. I loved it for a while, and didn't want to tell him that I loved just the 'quiet'. Thanks for sharing with SYC. We'd be great friends, Deborah. I'm social, but never mind being alone. I've heard about this book and will have to read it. Thanks for the recommendation. So glad you read this book because I had heard about it and was curious. You do really good book reviews by the way. Many years ago, I had a job and we took personality tests. My test on introvert/extrovert, scored exactly in the center! Our instructor told me that to "break the tie", I needed to answer would I rather spend an evening reading a book or going to a large party. Book won, hands down. I love studying about these aspects of personality and behaviour. An oldie but a goodie, one of the first I read on this topic, is The Birth Order Book. Have you read it? It has a lot of insight, too. Me again. I forgot to thank you for letting me know that I was a "no reply" blogger. I THINK I have it fixed. Thanks! I think in this world everyone seems to want to be an extrovert.... like it is an achievement to be the life of the party and be the most out-going person in a room. I have, in the past few years, embraced and finally come to understand, that I am an introvert and realizing that it is OK to be a home-body and want time alone, and to even not answer the phone, because it is normal for me (and so many others). Before I retired I was a trainer in a large insurance company and was "on" for 40-50 hours each week, it was physically painful many days. Many don't understand how I could do that job and say I am an introvert, but it is a classic definition. But, in order to do that job that I did love, I had to have hours of quiet time to gather my strength back to do it another day. I have told so many people that I was born to retire, and I think being an introvert has a lot to do with that. No more meetings, deadlines, presentations.... it is wonderful. My gardens, my books, my little bits and dabs of crafting, it all lends itself to being quiet and having some peace. I do have several very close good friends and do lunch and shopping trips quite often. Being an introvert does not mean that we are recluses!! My husband, however, is just the opposite of me, and after 42 years of marriage we both know my limits. Many times he will go off to a gathering and I choose to stay home. It works for us, and it really helps me to know that he is OK with that if I need to just have some quiet time. I am new to following your blog and look forward to your posts!!!! I guess I am a little of both..... I like you can spend hours working around the house...thinking, singing.. Just me on the mower....quiet and thinking.. Some of my best thoughts are on a mower....I also LOVE to read....Nothing like a good book... But, I also love cooking...entertaining...open Bible studies... I guess I am what I need to be when I need to be it....lol. I think there is to much pressure to always be something we are not... Be who you are! I think God gave each of us a unique personality... One good thing about blogging... freedom to express ourselves... Have a great day! Blessings! I have seen this woman talk on TED talks on YouTube. I think she makes some great points! I am too an introvert and I am happy that way. Me too :) Count Me in.This was very interesting,You were describing Me to the tee.Small talk with people who are not My close family is exhausting to Me also.I can relate to Your whole post :) YHEA that it's a good thing. I was introduced to this book fairly recently and loved it. Introverts, of which I'm one, are so often misunderstood, so the book really resonated with me. 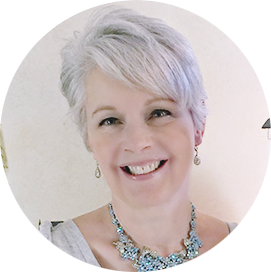 I might seem like a chatty Kathy, but I often dread social gatherings and find them stressful. My quiet husband on the other hand loves them , and I think he especially appreciates me breaking the ice and starting conversations for him to sit back , enjoy, and chip in when he feels like it. I know most who know me would consider me the extrovert and him the introvert, but they'd be very wrong ! I think I'll have to read this book. I'm back from our trip to the Peruvian coast and wanted to say hello and wish you a wonderful week. Wow...I am going to look this book up....love your post! My daughter, hubby and I are all introverts and we like it just fine. It's the current culture which tries to make us feel bad- like we are missing out and are party poopers. Haha! There is something to be said for valuing character as opposed to valuing volume and partying.